A charity like ours can’t survive without many generous people in the community helping out in lots of different ways. We are very grateful for the many churches, service clubs, businesses, volunteers and financial donors who assist us each week on an ongoing basis. 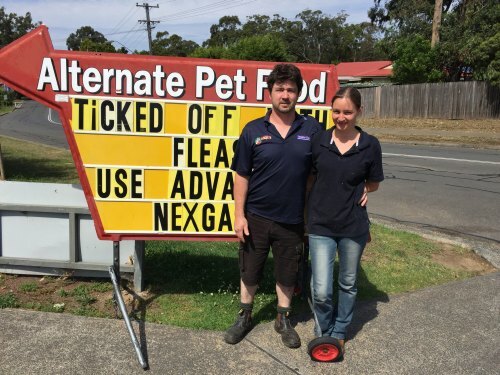 One such unsung hero is Mike Shannon at Alternate Pet Food in Bomaderry, a fifteen minute drive away from the farm. Mike has been donating expensive certified organic dog food to feed our poultry guardian dogs, for many years. “Lano” and “Woodley” are fed a mixture of this dry food and our chemical free meat every day to keep them healthy and comply with our organic certification standards. Mike is pictured here with one of his valued offsiders Narelle. Thank you very much for your generosity Mike. I’m really interested in getting in touch with Mike Shannon re his pet food. Could you please pass on my email or phone 4465 1922 to him, or let me have his contact details. Much appreciated, thank you.